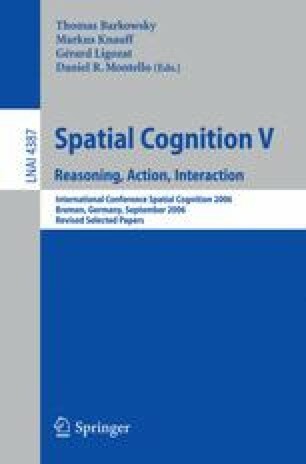 Cognitive agents use different strategies to identify relevant spatial information in communication. The chosen strategy depends on the agents’ conceptualization of the spatial situation at hand. This situation is determined by structural and functional aspects that are induced by the environment and the actions performed or intended therein. In this paper, we are interested in conceptualizations in the context of route directions. We focus on the meaning of prepositions used to characterize movements (actions) in spatially constrained systems such as street networks. We report on different strategies employed by people to disambiguate turning actions at intersections and demonstrate how these can be reflected in automatically generated route directions, again concentrating on the assignment of prepositions for anchoring movement. Including methods that focus on the most successful strategies people use in computational systems is a prerequisite for route directions that respect for human conceptualizations of spatial situations and that become, thus, cognitively ergonomic route directions.